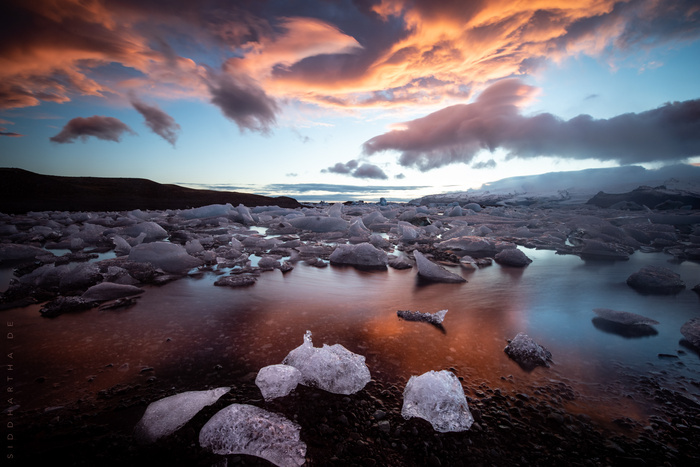 A vivid red sunset at Jokulsarlon in Iceland turned the water of the lagoon into wine. I was shooting here two days in a row. The first day was dull and overcast. The afternoon of the second day didn't look too promising either, but something happened for a few minutes - maybe the wind changed direction or something - and then the sky lit up in these blazing reds and golds. It was beautiful, but brief. The reds disappeared in minutes and were replaced by blues. Thank you, Geoff. Any suggestions? I am not generally into post processing so I am not your man for that. However the ice blocks at the front almost look like they were enhanced by flash.I am not familiar with this type of environment so it could be perfectly natural. If anything I would try to darken those 5 blocks in particular and the sky must have been quite vividly red to give you those reflections.Maybe a little more saturation. I am sure you took more variations of this. It is a great scene.Maybe the top half of the picture could have been enhanced by a varied neutral density filter.Overall though it is a great image.It is interesting when I look at the books produced of famous photographers of this sort of thing from the film days they would have battled to get this right and weren't really all that bothered because they didn't have the tools we have now. I notice though when I look at their current work they have certainly gone into the post processing like most people do in this group.The person who springs to my mind is Ken Duncan of Australia. Here is a link to his website. Well you did ask for some suggestions. Thanks for the detailed reply, Geoff. About the ice blocks in the front, the ice on land tends to be much whiter than the ice in the water since the liquid that fills the air pockets drains out. So this is something that always happens. You see much more whiteness and greater contrast if you have an ice crystal in your foreground that's not actually in the water. You can see it in the 2 blocks that are partly submerged. The parts that stick out of the water and are not 'wet' tend to be whiter. You can also see this for yourself at home with ice cubes on your kitchen countertop vs. ice that's in a glass of water (it helps of you have irregularly broken chunks rather than regular even cubes). I didn't use flash. You're absolutely right about using a graduated neutral density filter to enhance the sky. I don't have one for this lens (Nikon 14-24 f/2.8), as the front element is huge and requires 15 x 15 cm filters. I have NDs but not GNDs for this. I'll see if saturating the reds makes the scene look better. Thank you for your appreciation of the picture and your comments. My pleasure Siddhartha. Now that you mention that about the ice I noticed where someone made a temporary lens out of pure iceberg type ice recently on one of these websites. He made a 3d lens holder to attached it to his camera and had a window of about 30 seconds to take some pictures. Yeah, I saw that too. Gimmicky, but a novel idea, nonetheless.